My first day in Berlin was really exciting. I previously planned another session, but a colleague said David Chapell is a great speaker, and I can’t say he’s wrong! The good thing about this speaker is that he is not a Microsoft employee, so his opinion is not influenced by anyone. The first part of his session contained some technical details about Windows Azure. I think a lot of blogs have already been written about this, so I skip this part. The second one tries to answer the ‘Whens’ and ‘Hows’. The first reason to consider using Windows Azure is the pricing. Microsoft will put $0,12 on their account for 1 Virtual Machine/hour. Other pricing can be found online. When will you use Windows Azure? We must not expect to see all the applications run in the cloud in a couple of time. Azure is also not trying to bring existing applications to the cloud. 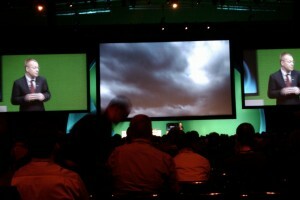 This session contained a lot of demos of the new capabilities of ASP.NET 4.0 in VS 2010. Visual Studio 2010 just recognizes these variables on its intellisense. In VS 2010 you can now specify your target framework. formview: property RenderOuterTable can be set to false, this won’t result in a nested table in the HTML output. Viewstate can be enabled, disabled or inherited. Controls now will have a property ClientIDMode which can be set to static, predictable, auto or inherit. The Page class now has two SEO ‘helper’ properties: MetaDescription and MetaKeyWords which enables you to dynamically change the meta tags of your page. Jason Zander presents us with Visual Studio 2010. He brought some fresh news to this session, declaring that MS have Acquired Teamprise. This is great news for companies with mixed environments. They could now put all their code, including Java and other technologies, in TFS 2010.
and also Oracle finds it way in the database projects of Visual Studio. The keynote was really a disappointment. 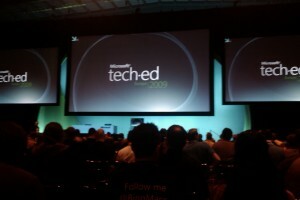 Secondly not a single technology for developers was discussed, so they better call it the IT professional keynote! Halve of the crowd just left the keynote session before it has ended. Oh yeah, what technology did they discuss in the keynote? I can only remember 2 things: Exchange 2010 and Windows Server 2008 R2. And between those presentations they want to mark the “New Efficiency” keyword. Microsoft really wants their products to work smoothly these days. So, this was Day 1 and I’m looking forward to the next day! I just felt historically wet and cold! Some more pics may appear in this post, but now I really need to catch some sleep!